Angle of Attack is used to define the angle between the wing chord line and the flight path. This is not to be confused with the relation of the aircraft to the Earth’s surface. This is called the attitude and is seldom, if ever, the same as the angle of attack. When the angle is small, the aircraft is said to be at a low angle of attack. When the angle is large, the aircraft is said to be at a high angle of attack. During landing, an airplane may have a level attitude, but a high angle of attack, because the flight path is downward and the approaching wind is parallel to the flight path. During climb, an airplane can be in a nose-high attitude, but at a low angle of attack. Two variables can change the amount of lift generated by a wing in a given configuration. • The speed of air flowing over the airfoil. • The angle of attack. An increase in speed or the angle of attack will increase both lift and drag. In level flight, lift must equal the weight of the aircraft. If an aircraft weighs 2,000 lbs., the wing must generate 2,000 lbs. of lift. The speed and angle of attack are interchangeable to a point—therefore, for every airspeed, there is a corresponding angle of attack that will produce the same amount of lift. In order for a wing to produce lift, the air flowing past an aircraft, must be aligned to the airfoil in order to provide a smooth airflow. 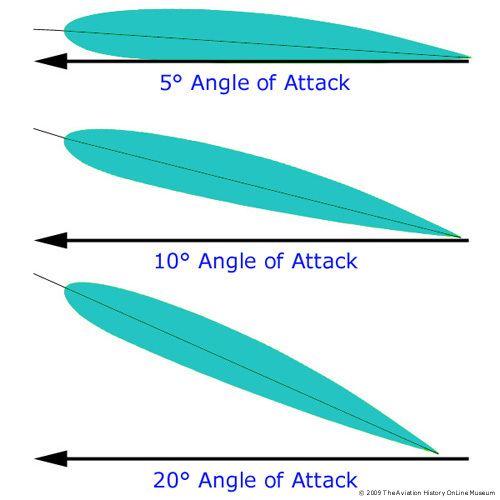 As a wing increases its angle of attack, airflow can no longer flow smoothly over the wing and eddies or burbles will form, causing the wing to approach its stall speed. When a wing finally stalls, it will no longer produce lift and with weight unopposed by lift, the aircraft will drop towards the ground. 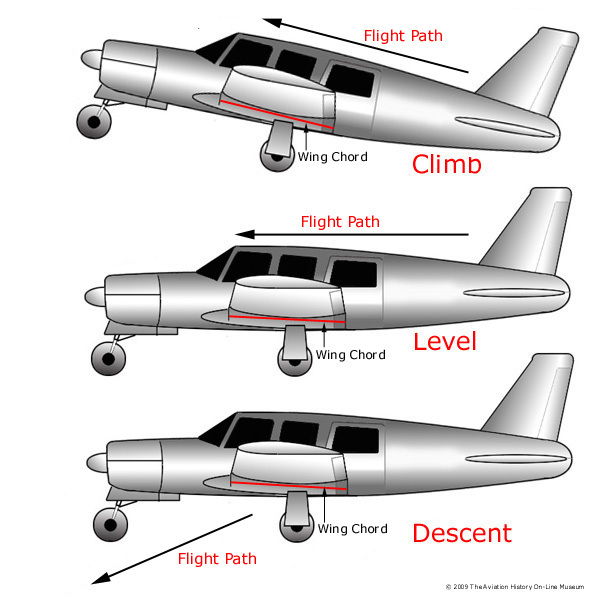 With sufficient altitude, stall recovery can be obtained by decreasing the angle of attack. Angle of Attack is the angle between the wing chord line and the flight path. An airplane can be stalled at any attitude and at any airspeed such as pulling out of a dive too abruptly or if the airplane is in a steep turn at a high angle of attack, even though the airspeed is high. During dives or turns, centrifugal force will increase load factors and if excessive, this will cause the wing to stall. 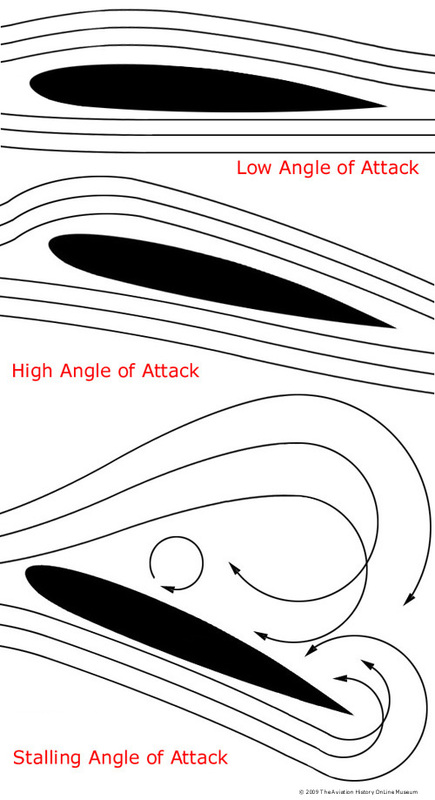 The angle of attack should not be confused with the angle of incidence. The angle of incidence is the angle formed by the wing chord line and the aircraft longitudinal axis. Refer to the page on relative wind for comparison.